For the First Time Ever, an Amateur Wins! The World Series of Poker would experience something for the first time in 1979 — an amateur won the title, and the tournament would never be the same. Although the win by Hal Fowler wasn’t as revolutionary as the Moneymaker effect in 2003, it did lay the groundwork for the growth the WSOP needed at the time. Preliminary events in 1979 saw two double-bracelet winners. Gary “Bones” Berland won two bracelets for the second year in a row, and, once again, both came in variations of seven-card stud. Lakewood Louie also took home two pieces of gold hardware, one in a $1,000 ace-to-five draw lowball event and one in a $2,000 five-card draw event. The reigning world champion, Bobby “The Owl” Baldwin, claimed another bracelet for his collection in the $10,000 deuce-to-seven lowball event. Johnny Moss added to his legend with a win in the $5,000 seven-card stud event, while Doyle Brunson won the $600 mixed doubles event with Starla Brodie. Also, Dewey Tomko picked up his first gold bracelet that year in the $1,000 no-limit hold’em event, the last preliminary before the main event. 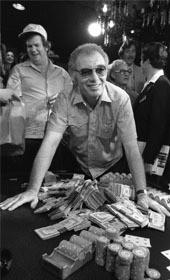 The world championship drew a field of 54 entrants in 1979, and eight of those players were amateurs, which was the largest showing by this group of players in WSOP history at the time. One of them was named Hal Fowler, and he was certainly the last amateur standing when he made the final table. He was joined by Bobby Hoff, Baldwin, Crandell Addington, George Huber, Sam Petrillo, Sam Moon, and Moss — every one of them a professional, and every one of them a world-class player. And then there was Fowler, who was the owner of a public relations firm. When action got under way, Moon was on top with 138,900. He eliminated the defending champion rather quickly when he made a set of aces over Baldwin’s set of eights. Moon was card-dead after that, and Hoff jumped into the role of the aggressor. Hoff used this rush to build a massive stack of 225,700. It was Hoff who eliminated Moss in fifth place. Fowler then busted Moon in fourth place and Huber in third. It was now down to the final two players. A professional and an amateur would play for the world championship. Fowler shoved his stack, worth 250,000, all in early in the match and scored a large victory over Hoff when he doubled up. As the match continued into the night, Fowler’s inexperience showed as he pushed the incorrect amount of chips into the pot a number of times. Fowler was on the brink of elimination at one point. He pushed all in preflop with K-J and Hoff made the call with Q-6, while both a queen and a jack sat on the board on the turn. A king on the river rescued Fowler from doom, though, and he grabbed the chip lead. Hoff lost another pot to become a 3-1 dog in chips, but he fought back. Hoff decreased the deficit to just 70,000 by winning all of the small pots, but fate was always on Fowler’s side for the large ones. Fowler won a crucial pot once again when Hoff woke up with pocket aces and pushed a large amount of chips into the middle preflop. Fowler called with 7 6 . The flop was dealt J 5 3 , and Hoff fired again, this time for 40,000, which was half of his remaining chips. Fowler chose to chase an inside-straight draw and made the call. The 4 on the turn ensured he would get paid, and Hoff moved all in for his last 43,000. Fowler called, and the inconsequential river card was the 10 . Hoff won $108,000 and he was dejected by the loss. Fowler took home the gold bracelet and $270,000. In what would become a historic trend for poker, what was good for the amateur was good for the game. Fowler’s victory would show immediate benefits for the tournament a year later at the WSOP.